Notes: The fine quality and decoration on this exceptional bowl tie it closely to the fine mid-14th century jars decorated with very similar arrangement of fish and aquatic plants. 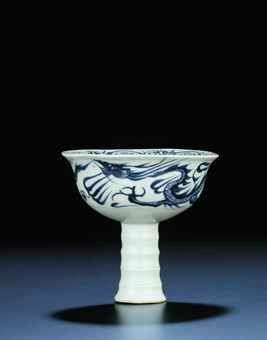 Compare the present bowl with the famous Yuan dynasty prototype in the Museum of Oriental Ceramics, Osaka, illustrated in Masterpieces of Oriental Ceramics, Museum of Oriental Ceramics, Osaka, 1994, p. 54, no. 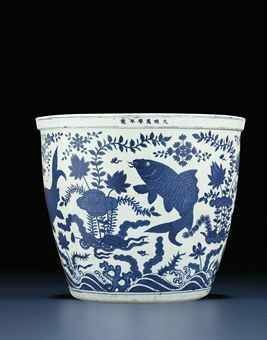 29 and another Yuan 'fish' jar sold at Christie's London, 11 July 2006, lot 111. It is not surprising that the depiction of fish in water has come to provide a rebus for Yushui hexie 'May you be as harmonious as fish and water'. Such symbolism is particularly appropriate in the context of marriage, and decoration including two fish additionally symbolises both fertility and conjugal happiness in the same context. Much of the popularity of fish as a decorative theme, especially in later dynasties, hinges on the fact that the word for fish (yu) is a homophone for the word for abundance or surplus (yu) - thus two fish represent doubled abundance and a gold fish (jinyu) an abundance of gold. The fish on the current jar provide a more complex rebus, since they appear to be qing black carp (mylopharyngodon piceus); (hongqi) bai predatory carp or redfin culter (culter erythropterus); lian silver carp (hypopthalmichthys molitrix); and gui or jue Chinese perch or mandarin fish (siniperca chuatsi). The names of these fish combine to provide rebuses which suggest either, Qing bai lian gui, 'Of good descent, modest and honourable' or Qingbai lianjie, 'Of honourable descent and incorruptible'. 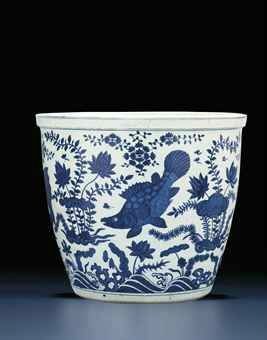 The specific combination of fish seen on a number of Yuan dynasty jars was not only copied in the Xuande reign, but also in the 16th century as can be seen on the present bowl. It is probably no coincidence that a painter like Liu Jie (active c. AD 1485-1525), who served as a court artist in the early years of the Jiajing reign should have painted fish following the approach of Yuan dynasty artists. Records of porcelains to be commissioned from the imperial kilns for the Jiajing Emperor (1522-55) note that in the 21st year of his reign he ordered 200 blue and white guan jars decorated with qing, bai, li, and gui - almost the same fish that appear on the Yuan dynasty guan jars. 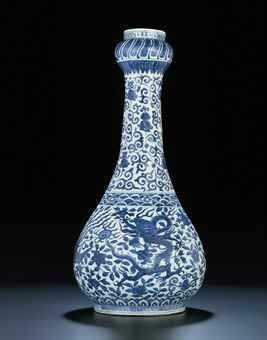 While such an order was in keeping with the Jiajing Emperor's deep commitment to Daoism, and may also suggest the influence of painters like Liu Jie, it may additionally suggest that the Yuan dynasty jars,such as the example sold at Christie's London cited above were known at the Jiajing and Wanli courts, and indeed may have been handed down by succeeding Ming emperors.